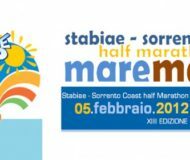 The 13th Edition of the Mare e Monti Half Marathon will take place on the 5th of February 2012. The race starts from Castellammare di Stabia, from the Nuove Terme area, at 9:00, to finish nearby Sorrento, in Piazza Angelino Lauro. Friday, February the 3rd and Saturday February the 4th, the event will be preceded by agricultural food exhibitions of the Sorrento Coast products and by conventions, besides parties and musical entertainment moments. The Mare e Monti Half Marathon, therefore is not aimed at the competitiveness, but even to attract people hunting for fun and authenticity. After the success of the 2011 edition which chose Stefano Baldini, the Athen 2004 olympic gold medals, to advertise the race, even for this year it is expected a considerable involvement to the event. In the last 12th edition the winners were Yassine Kabbouri among the male runners and Deborah Toniolo among the female runners. This Year the Telecapri Sport tv cameras will shoot the event. 10:00 a.m/8:00 p.m. Delivery of the race numbers and chips. May (on a date to be defined) Nuove Terme di Stabia – Price Giving Gala Night to the sport club and athletes. Description: The 13th Edition of the Mare e Monti Half Marathon will take place on the 5th of February 2012. Read the program and all details about it.